As we look south down Front Street in 1910. we see several well known businesses. 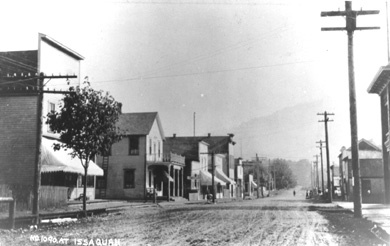 The building at the far right edge of the photo is the Bank of Issaquah (now a bicycle shop). The buildings on the left (from foreground to background) are Van Winkle’s Store, Pacific Hotel, Cubbon’s Grocery, Gibson Drugs, Barber Shop, IOOF Hall, Clark’s Saloon, Holmes “Tailor”, Garner’s Barber Shop, Soapy Smith Candy, and E. J. Anderson’s Hardware Building (now called the Wold Building where Jak’s Grill is located).